Spanning the breadth of central London and reaching the outskirts of Cambridge, The Diocese of Westminster is responsible for over 200 Catholic schools consisting 163 Primary, 39 Secondary and 18 Independent schools. The Diocese's aim is to "provide sufficient Catholic School places to meet the demand for access to Catholic Education from Catholic families living within the Diocese ". The annual responsibility for fair pupil placement and strategic management for subsequent years falls to Nigel Spears, Assistant Director of Education. Nigel is responsible for ensuring that every school has placed Catholic pupils appropriately to meet both the demand from families and the criteria set by the Church and Diocese. Nigel and the team at the Diocese rely on this data to provide insight into Catholic pupil demand across their region. This data is needed to be shared with colleagues and parents but more importantly to assist in maintain Catholic pupil placement in years to come. But how is it possible to understand, visualise and share pupil demand across such a wide area and 200 schools? From past experience Nigel knew that traditional paper-based data collection methods would not suffice due to the length of time and administrative effort required. To ensure the process ran as smoothly as possible, pro-Forms® online forms was introduced to the team and shortly afterwards a Pupil Placement Register form was created in pro-Forms® so that Head Teachers could submit their pupil data at the start of of the 2018/19 school year. The reasons for hidden calculations, Lookup files and auto-population is to ensure the data is as error-free as possible on entry. All school names and LA reference numbers pre-prepared in set a format so the data was consistent and accurate. As with all new processes, uptake can sometimes be slow as users adapt and grow in confidence. To maximise the submission rate for the online forms, Nigel circulated a 'completion guide' ahead of the proposed go live date to give Head Teachers ample opportunity to raise any questions and reduce submission delays. The unique link to the form was published in the Diocesan Autumn bulletin and via direct email to all Head Teachers, after which submissions started to gain momentum quite rapidly. In order for Nigel and his team to visually gauge the spread of Catholic and Non-Catholic pupils, we introduced them to our Power BI connector as means of real-time results display and analysis. Already being familiar with Power BI, Nigel quickly selected which fields from the form were to be pushed via the connector to his newly built Power Bi dashboard so that the latest position across the Diocese could be seen and shared in real-time. Nigel set up charts, graphs and maps that would represent Catholic pupil count amongst schools, Local Authorities and year groups. Postcode areas were highlighted on an interactive map. As a new postcode were submitted, the area would be automatically added to the map. 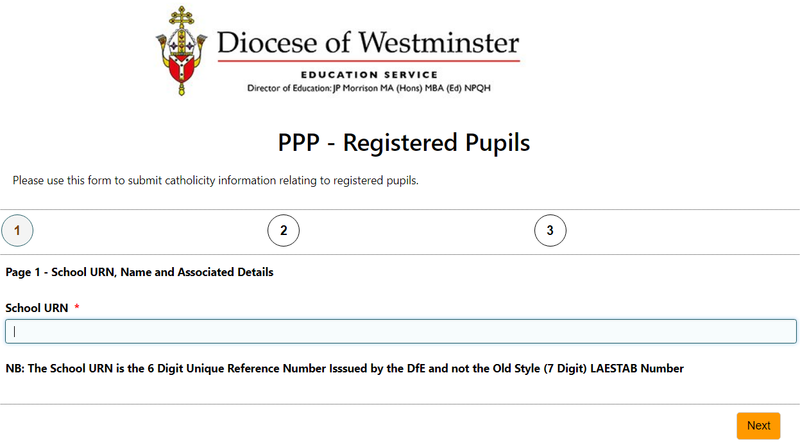 Parents, colleagues and teachers could access the dashboard directly from the Diocese public website thanks to the Power BI shareable link being added to an iframe on the education section of website. 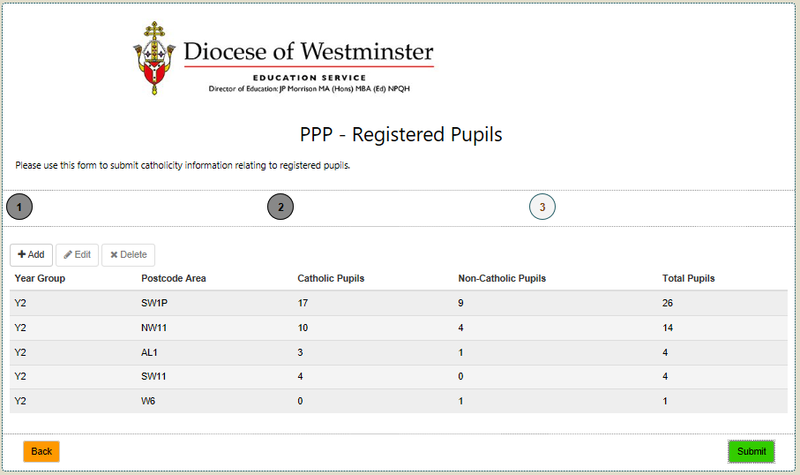 Designed to be fully interactive, the dashboard provided visitors with easy to navigate tools such as dropdown menus, filters and sliders to allow easy selection of Catholic pupil representation by area, Postcode, school as well as by year group. Within the first two weeks, over 30,500 thousand pupil's data was submitted and fed into the dashboard in real-time. There was no need for Nigel to manually export or upload data meaning viewers were always faced with up-to-date, accurate data. "The use of the pro-Forms® online data collection system enabled us to develop a system that ensured that locally prepared data was quickly and efficiently communicated on our website. Visitors to our website can review the data interactively using Power BI. Diocesan Trustees are delighted with the response rate thus far and hope that the remaining schools will contribute soon." 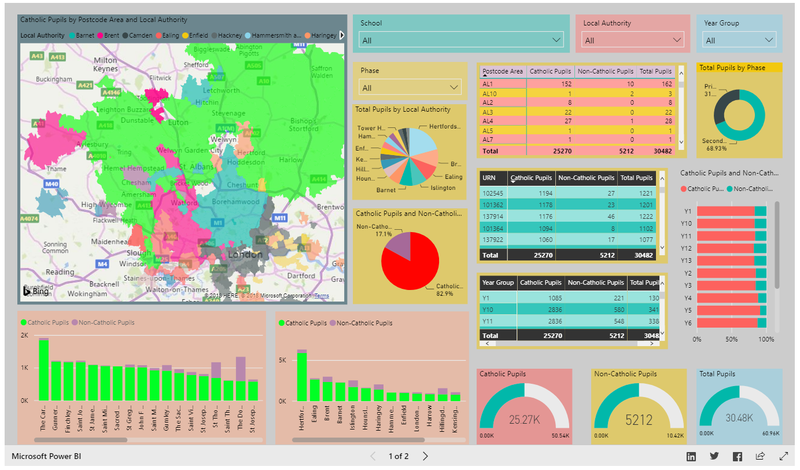 Why not have a look at the visual impact of this truly interactive, real-time dashboard and see the how the Diocese seized the opportunity to harness the potential of using our connector with Microsoft Power BI. We're always happy to hear from prospective customers to find out where their inefficiencies lie. Whether your team is looking to bring together data from multiple sources into a visual platform or is simply struggling with the burden of paper, we're here to help.